PREMIUM QUALITY - Well made, not junk! Thin and Lightweight - Not big and bulky. 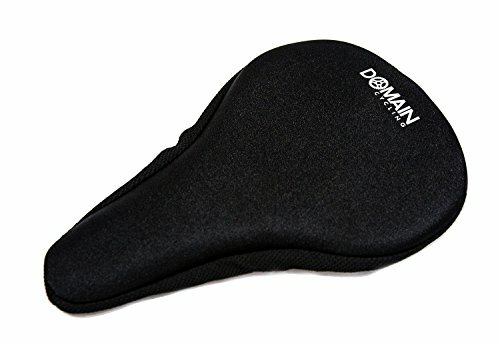 Fits nicely on saddles and doesn't feel like a lump on top of your seat! Once you pull it tight, it conforms to the shape of your saddle and stays put! PLEASE MEASURE CAREFULLY - This Seat Cover Cushion is about 10.5 inches Long & 7 inches Wide. Fits most spin bikes and traditional road bikes. DOES NOT FIT WIDE BIKE SEATS. 100% money-back guarantee - If you are not happy with your purchase for any reason, we will take it back. Just return through Amazon. No need to compare to others, stop browsing and Order Now! Thanks! DESIGNED FOR INDOOR SPIN BIKES, EXERCISE BIKES, & OUTDOOR CYCLING - Most of our customers use our seat cover at Spin Class, but it works great for all types of bikes including Spinning Bikes, Exercise Bikes, and Outdoor Bicycles. Please measure before you buy: Our Seat Cover Cushion is about 10.5 inches long by 7 inches wide. It will NOT FIT WIDE BIKE SEATS.